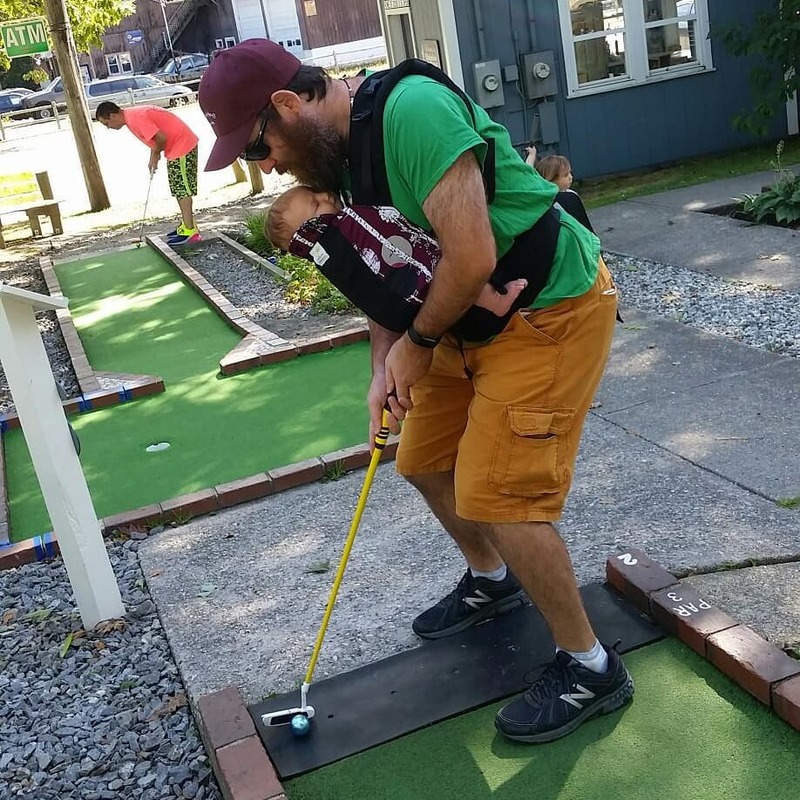 Hard to believe it has been a bit over three months since I took part in a miniature golf tournament but that�s kind of how it goes in New England. As a result, to catch up I�m breaking this post up into two sections, I hope you enjoy. While there are some tournaments that are popping up over the summer, most tend to be in the fringe of the season (May or September) to take advantage of slower times at the courses. Unfortunately I also missed the most local tournament to me, the Farmington Miniature Golf tournament in August, due to a death in my extended family. That ends up being a double downer because I tend to find that miniature golf, especially tournament prep and play, if one of the ways I use to pull myself out of the rough stuff of everyday life and have something positive and fun to focus on. However, since it was a two-day tournament I did get a chance to visit day two and support my fellow penguin Mandy (who came in second in the lower tier) and watch my friend Mark �The Highlighter� Novicki win the tournament. I also got a chance to do some media work taking some videos and pictures. As part of that I put together a video where I did some golf �commentary� for the 1st place playoff. I think the minigolf world needs more of this type of media to help push it to the forefront and I�d love to do something like a minigolf podcast one day to further expand our reach. With that tournament on the back burner, it was now time to turn my attention to what is probably my favorite tournament of the year � the Maine State Dolphin Open. This year marks the 25th time the tournament was held and it will be my ninth time playing in it. This year we played a six-round tournament, played in three, two-round sections. When you combine that with the 2008 U.S. Open held at the same course (Dolphin Mini Golf in Boothbay, Maine), I will have played over 100 competitive rounds of miniature golf on this course and at least another 100-150 practice rounds. I talked a bit about how the course plays in my blog from last year, and luckily it doesn�t change that much so I can limit my practice rounds without any fall off in my play. With all that in mind, we head up to Maine on Thursday evening and are met by the Highlighter for dinner. We don�t get a chance to get to the course that evening as a massive thunderstorm knocked out power across the town so the course is closed for the night. The next day I hit the links, first with the family in the morning. It�s great to be back at the course and great to start seeing the rest of the minigolf �family� that plays this tournament. It�s a great mix of locals and USPMGA pros from the Northeast and over the years we�ve formed a congenial group. We don�t spend a lot of time together off the course (with families and own vacation preferences and all) but the 8-10 hours on the course each day we�re pretty tight. There�s a few familiar names playing this year that haven�t been to the tournament in a couple of years, so it�s great to see those faces. There�s some new folks too and we make them as welcome as possible. I start my practice in one of the most difficult ways possible � with a 14 pound daughter strapped to my front. It takes some adjusting and the first round is a 41. But we go around again and I shoot a 36, which would be respectable for the tournament. Bring it on all you non-baby-wearing players! I leave the family for the afternoon to focus on playing practice rounds with Highlighter. My goal for the day is to figure out which ball I want to use. Do I use the dark blue Chromax which has brought me a win and a second place the past two years, but is quite beat up now, or do I go with the newer, light blue Chromax? I choose the blue theme because of the Maine blueberries � and yes, miniature golfers have just as many weird and superstitious habits as every other athlete. We get through seven rounds and I end up selecting the dark blue ball. May the force be with me. I�m feeling good about my scores overall though I could do with shaving a couple strokes off if I want to be in the top again. Over the years I progressively finished better at this tournament and with my current streak I feel like there�s some pressure to keep up the high standard. I didn�t do a formal handicap of the tournament prior but there are four former winners in the field, including the owner Lee who is looking to defend. I put my odds as good to be in the top 4, but maybe only a 1 in 5 chance of pulling out the win. Friday evening�s dinner is Chinese food (dinner of champions of course) outside in the fading Maine late-summer sun. It�s a beautiful way to enjoy a vacation and we head back to the course for another evening round and some ice cream � the Ice Cream Hut at this course is also one of the best tournament adjacent places on tour.